How Sharp is an Obsidian Knife? 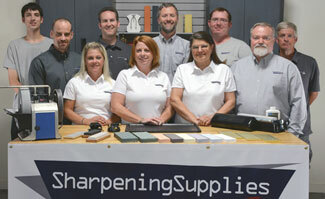 Home / Sharpening Articles / Sharpening Blog / How Sharp is an Obsidian Knife? If you're anything like me, the thought of quantifying the sharpness of an obsidian knife is pretty exciting. 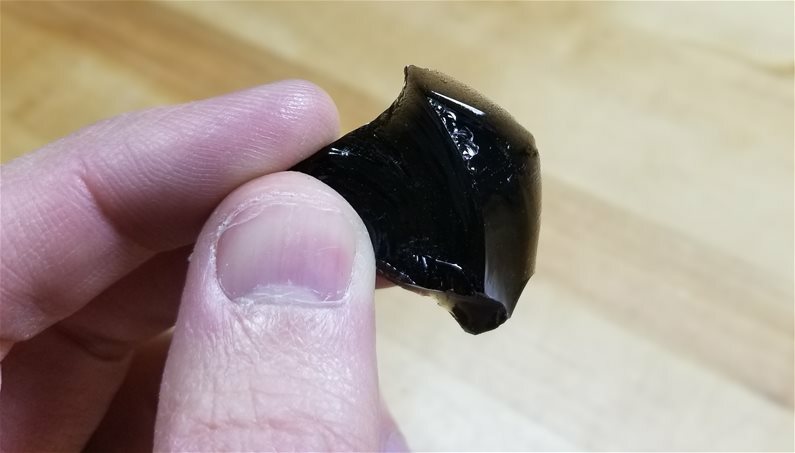 If you're not familiar with obsidian, it is a glass like stone that was used historically for making arrowheads and knives. Fortunately, I have access to the Edge On Up PT50A Industrial Sharpness Tester. This made it possible to be objective about the edge. While an obsidian edge definitely feels sharp, I needed more granular detail than my calibrated thumb could provide. My thumb only has 4 levels of sharpness; really dull, dull, sharp and really sharp. My thumb test came up with really sharp, but I wanted to know more. I have heard stories that an obsidian edge can be sharper than a steel blade but I can easily sharpen a steel knife to where my thumb will say it is really sharp. Flintknapping is the technique used to make an edged tool out of stone such as obsidian, flint and chert. Obsidian is very hard, so I tested obsidian. In practice, flintkanpping involves striking a piece of rock to break it into sharp flakes. I am definitely not a flintknapping expert so the purpose of this experiment wasn't to test my skills at crafting a fine blade, but rather to see if I could make an edge that would be as sharp or sharper than a steel edge. My example wasn't pretty, but I was able to achieve what I thought was a sharp edge. If there is any advice I'd pass along for the first time flintknapping enthusiast, I would say wear safety glasses and work in an area that you don't mind being contaminated with glass like shards. 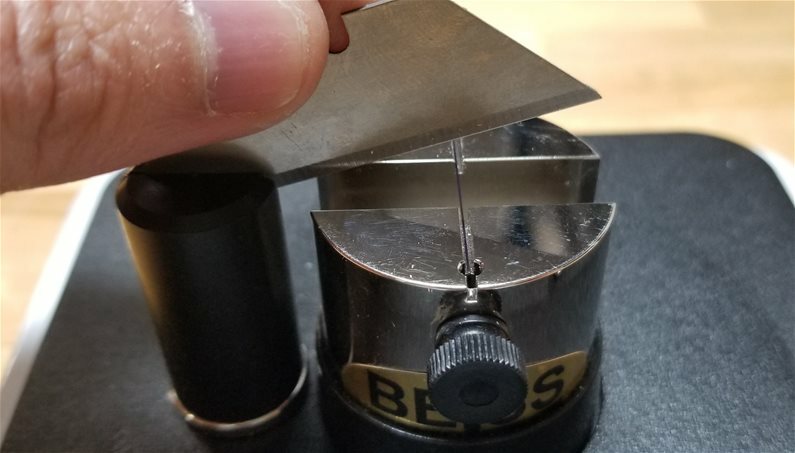 For testing to be objective, I used the Edge On Up PT50A Industrial Sharpness Tester from our shop. Not only do we sell this machine, but we use it to test products and evaluate sharpening techniques. An invaluable machine in our shop. This device works by measuring the maximum force it takes to cut a piece of test media. A lower number indicates that it took less force to cut the test media. We tested the the newly flintknapped piece of obsidian. Holding the piece of obsidian proved to be the only slightly challenging part of the process. Not that it was hard to hold but because you can't allow your hand to come in contact with the test device as the test media is being cut. It took a few trials to ensure a proper test. Testing the sharpness of the flintknapped obsidian. For a good test comparison I took one of the brand new utility blades from our warehouse. In our experience, they are sharp and consistent which makes it a good benchmark. Testing the sharpness of a brand new utility knife blade. Now for the exciting part. The results are in and the obsidian was almost twice as sharp as the brand new utility blade. 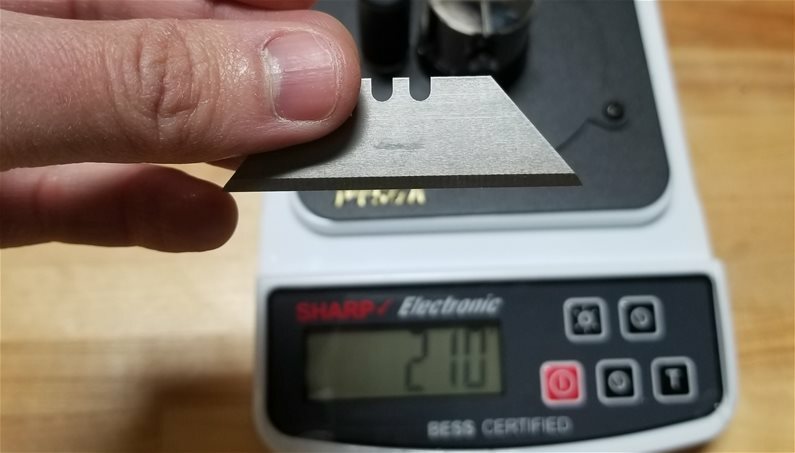 It only took 134 grams of force to cut the test media vs. 210 grams to cut the media with the utility knife blade. That is quite an achievement and a verifies that an obsidian blade can indeed be as sharp or sharper than a knife blade. More testing will need to be done to find the absolute maximum achievable sharpness for an obsidian edge. The test results of the obsidian edge were quite impressive. 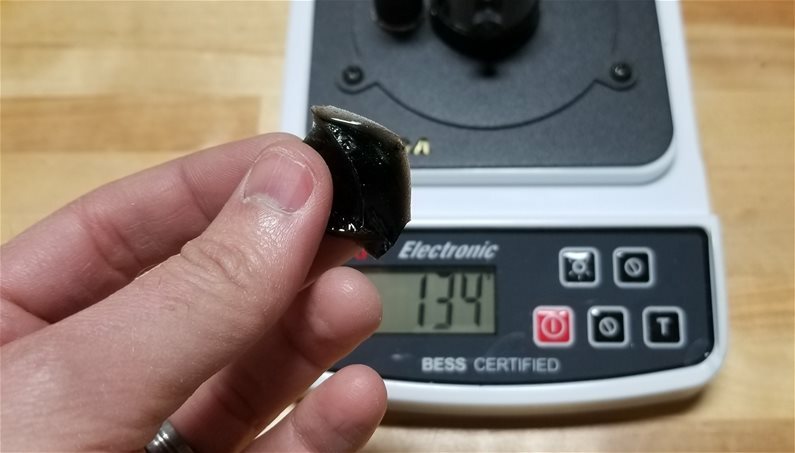 It only took 134 grams to cut the test media. It took 210 grams to cut the test media with the utility knife blade. That is quite sharp, but not as sharp as the obsidian. While I confirmed that obsidian can indeed be flintknapped to a very sharp edge, there are so many more questions that I'd like to test. Here is quick list of questions that remain after the test. 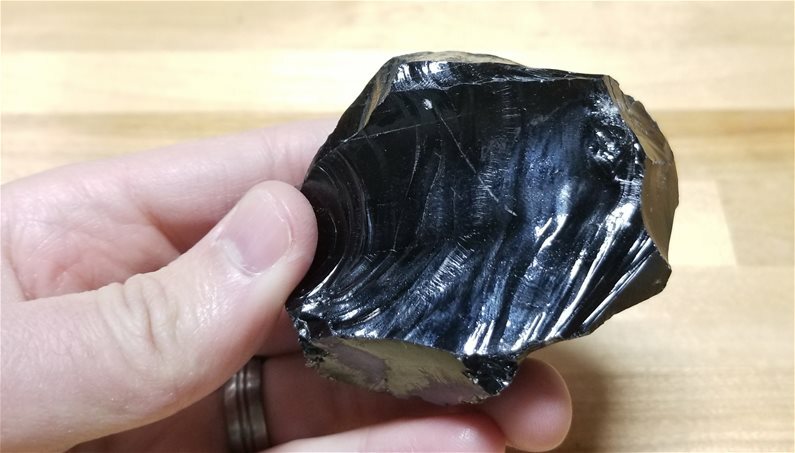 Can you make an obsidian edge even sharper? What factors affect the sharpness of an obsidian edge? How long does an obsidian edge last? 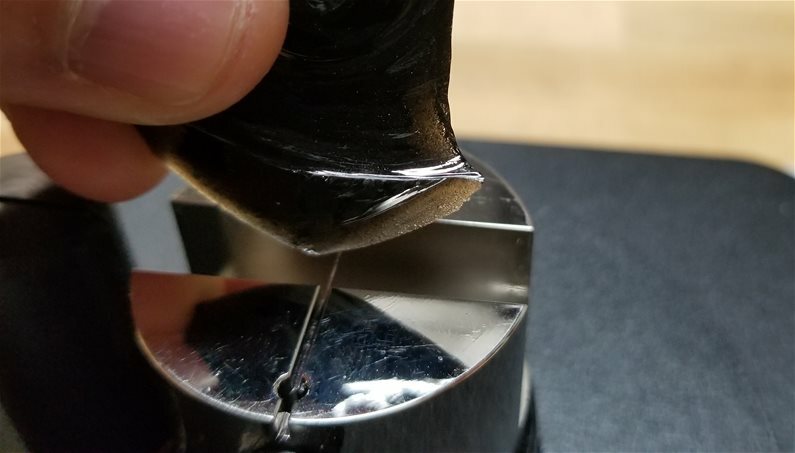 Can a steel edge be sharpened sharper than obsidian given better materials and sharpening techniques? Do different types of obsidian sharpen to a finer edge? How does obsidian compare to flint or chert? I look forward to doing more testing in the future so I can get these questions answered. Please check back or follow us on Facebook as future results will be published there.